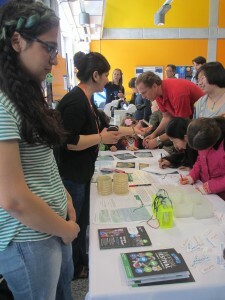 The National Institute for Health Research (NIHR) Health Protection Research Unit (HPRU) in Healthcare Associated Infections and Antimicrobial Resistance at Imperial College London had a great presence at the Imperial Festival over the weekend of the 8th-10th May. 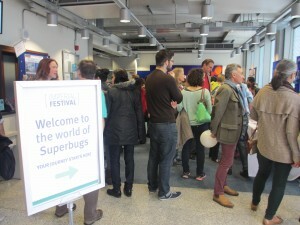 Many of our researchers hosted interactive stands in the ‘Superbug Zone’, based in the Flowers Building, which gave visitors the opportunity to journey into the world of ‘superbugs’ find out more about them and discover the impact that these bugs have on our health and wellbeing. We asked the public to vote for what they felt was the main cause of antimicrobial resistance from a choice of nine factors (click here to find out what antimicrobial resistance is). It was great to see how engaged people were with the issue and how many people already knew about it. Hopefully we dispelled a few myths over the weekend (for example, it is not the person that becomes resistant to treatment, but the bacteria that is causing the infection), and to the 405 people that voted, our main take home messages were: not to pressurise your GP into prescribing antibiotics if you don’t need them, to finish the course of antibiotics when they are prescribed them and to dispose of any unused medicines safely rather than stockpile them ‘just in case’. 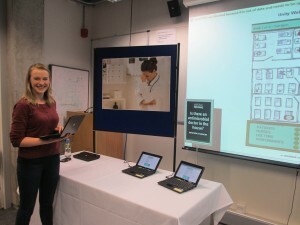 ‘On Call: Antibiotics’ is a serious antibiotic prescribing game targeted at hospital clinicians and healthcare professionals which has recently been developed by researchers at the unit. It aims to ensure the continued engagement of prescribers with optimal antibiotic prescribing behaviours and help to resolve some of the behavioural and social barriers influencing prescribing. 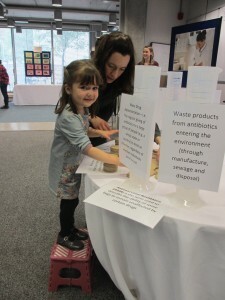 It’s showcase at the Imperial Festival was a great success and although it requires clinical knowledge to play, it helped to facilitate many interesting conversations around the importance of appropriate, timely and prudent antibiotic prescribing to help reduce the increasing incidence of drug-resistant infections. It also shed light on the types of competing pressures that doctors face on a busy hospital ward, allowing the public to see firsthand how over-prescribing or inappropriate prescribing may occur. With keen interest (and often quite skilled diagnosing and treating) from some of our younger attendees, we may have some budding doctors in our midst! This stand gave visitors the opportunity to find out how well they wash their hands. They rubbed a cream onto their hands that reacts to UV light and the challenge was to wash their hands normally and see how much cream was removed. Children visiting the stand had real fun seeing their hands glow green but took the challenge seriously and often did better than the adults! Many were surprised at the areas of their hands that were sometimes missed during washing and were genuinely interested in being shown the WHO guidance on how to wash thoroughly. We talked with visitors about how essential hand hygiene is for health workers and the public, and they left with an understanding of how important hand hygiene is in controlling the spread of infection. To help the public understand the importance of hand washing and infection control, the team provided Mannitol Salt Agar plates for participants to press their fingers onto to see what bacteria, if any, would grow from their fingertips. Some of the participants also pressed their fingertips onto the Agar plate before washing their hands and then again afterwards. This enabled the public to see how well they washed their hands. With most of the participants there was less or near to none bacteria seen on the plates after handwashing. The plates were incubated at 37oC and checked the following day to see the bacteria grow. The photos were sent to the participants with the explanation that they had normal skin bacteria present on their fingertips! 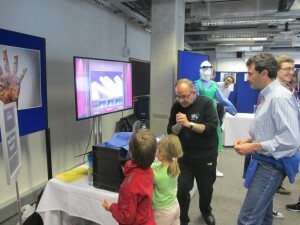 The activity demonstrated to the public three key messages – that bacteria is living on their skin; it takes up to 24hrs to grow and that regularly washing hands gets rids of most of the bacteria.